In the card above, it looks like the lady is dreaming of her perfect dance partner and they are both dressed as if performing on stage. She wears ballet shoes and the couple above is dancing ballet. Not everyone can dance ballet, nor do they want to…it is very specific. My go to key words for The Lovers is "perfect match". We love who/what we love simply because we do. There is no reasoning or logic to it. It means when you are making a choice/decision, choose your heart over your head no matter how crazy that choice may seem. ie. the seeker will find a job/house/person/thing etc. they'll fall in love with or is the perfect match for them. Make sense? It does seem to be pretty focused on love, but I've often thought of it as a type of choice... like choosing what you WANT, which may be riskier, versus what may be the more practical, and safer, choice. But I see myself as the man in the card, choosing between the stable significant other (in the foreground, a little distant and aloof) and the tempting new lover (dancing with him, showing excitement and a desire to be close). A woman might see it differently if she thinks of herself as one of the two women... maybe someone trying to take something from you, or trying to take something that belongs to someone else. 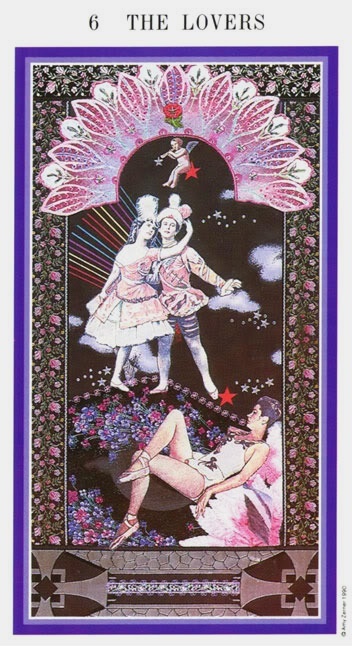 Is the lovers card only used as a card that represents Love? What else can it mean? From a business perspective it can absolutely be about contracts.